A hat-trick from the prolific Savio Gemini helped Kingussie shoot to the top of the Mowi Premiership with a 4-1 away win over Kinlochshiel. They were helped on their way by local rivals Newtonmore, who defeated previous leaders Lovat 3-0 in Kiltatlity. Caberfeidh were 3-1 home winners over Kilmallie and Lochaber squeezed a 1-0 success at Inveraray. 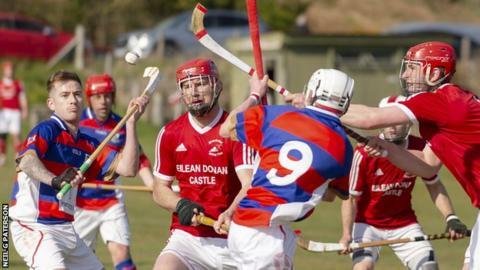 Kyles edged Oban Camanachd by the odd goal in seven in the remaining Premiership game, the Argyllshire derby. John MacRae opened for Shiel, but Genini had Kingussie ahead by half time. Roddy Young added to Kingussie's tally before Genini completed his hat-trick to secure a recently rare top spot for the Badenoch side. Iain Robinson got an early breakthrough for Newtonmore and a Glen MacKintosh double effectively ended the contest in a little over half an hour. Ryan Johnstone scored the only goal in the first half of a game in which Lochaber grabbed their first win, leaving Inveraray as the only side without a point. Caberfeidh's opener came from Craig Morrison. Craig MacIsaac struck back and Robbie Brindle soon put Cabers in front again before Kevin Bartlett's late clincher. Colin MacDonald got the only goal of the first half for Kyles shortly before break. Soon after play resumed, Daniel MacVicar and Andrew MacCuish swung the game Camanachd's way, but Robbie MacLeod soon equalised from the penalty spot. A Ross MacRae double put Kyles in charge, although the game went back on a knife edge with MacCuish's second in the penultimate minute. Oban's Gary McKerracher was sent off. Kyles still have maximum points from three games and sit third, two points behind Lovat and four from Kingussie, both of whom have both played six. A 6-0 home win over Strathglass maintained Fort William's 100% National Division record. They are three points clear of unbeaten Glenurquhart, who eclipsed Bute 7-0 in Drumnadrochit. On a day when all four second-tier games were between top and bottom-half sides, Skye defeated Oban Celtic 5-2 at Mossfield and it was 1-0 for Glasgow Mid Argyll over visitors Beauly. The dismissal of Ross MacMillan meant that both Oban sides finished the day a man down.